Now we can discuss calibers of choice for hunting or shooting. I have been told that if you participate in some of the NMLRA events that the largest caliber allowed is a .40. I do not know this for fact however. For the hunter wanting to pursue turkey I would recommend you use a 12 or 10 gauge muzzleloading shotgun. They are offered in single and double barrel. They also have flintlock shotguns. 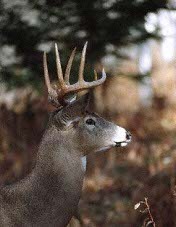 For deer alot of the choice will be made by you in your states game regulation's. Check them for minimum required caliber. Most people opt for at least a .45 caliber, with the majority of them using .50 caliber. For elk, moose, or bear I would recommend a .54 or larger. I think a .54 would be a wise choice simply as you will get a bit more punch as well as some states also having .54 as the minimum requirement. You have some massive bones in those animals and you need a pretty good hunk of lead to plow through them and still be able to do the job at hand. Also by choosing the larger bores you do get a bit more velocity when shooting at longer ranges, and that can be crucial if you see an animal at the amximum range you've set for yourself.